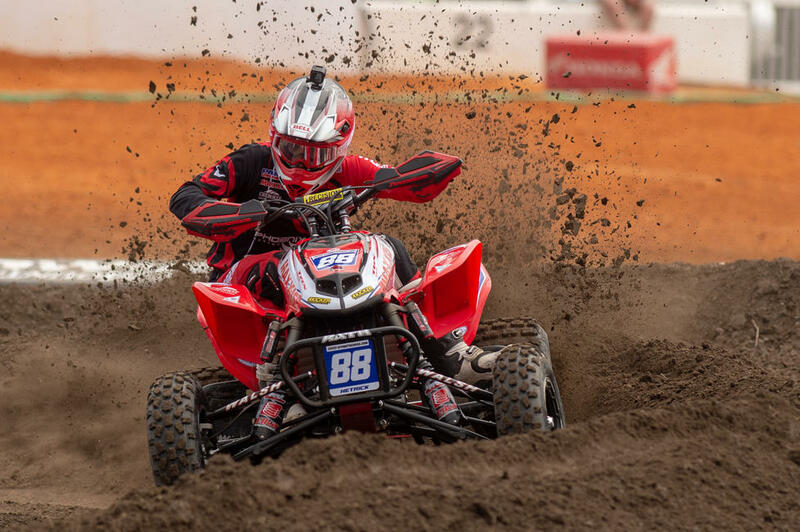 Salisbury, NC (3/12/2019) – Phoenix Racing Honda rider Joel Hetrick put several years of bad luck behind him and dominated the Pro-only season opener for the AMA Pro ATV Motocross National Championship at Daytona International Speedway. Haedyn Mickelson also competed in the Pro ATV class for the team, while Jace Owen rode in the 250SX Supercross motorcycle portion of the racing week. Hetrick has been singularly focused during the offseason to starting the season off with a victory. He’s been close several times, but bad luck always seemed to show up. Not this time. After taking the holeshot, Hetrick led every lap of the main event. Riding his DASA-powered Honda, Hetrick was virtually unstoppable during the weekend. With Elka suspension and Maxxis tires under him, he rode a smooth and consistent race. The team is also welcoming new sponsors Moose Racing, Bell Helmets, and 100% goggles. Mickelson is running his first full season in the Pro class this season. After a making it as high as fourth in the race, Mickelson fought his way through arm pump to finish 11th. Owen was competing in his second Supercross race of the season in the 250SX East Coast Championship. The team installed a new engine in his Honda and he was off and running. After qualifying for the main, he was up to eighth when he crashed in the whoops section. He sustained a back injury, but plans to take next weekend off before returning to racing in April. Hetrick and Mickelson will join up with the rest of the Phoenix Racing ATV team when the ATV Motocross Series holds its next race April 6-7 at Underground MX in Kemp, TX. That event will feature all of the ATV classes. Owen will be back in action for the Supercross Series on April 6 in Nashville, TN.